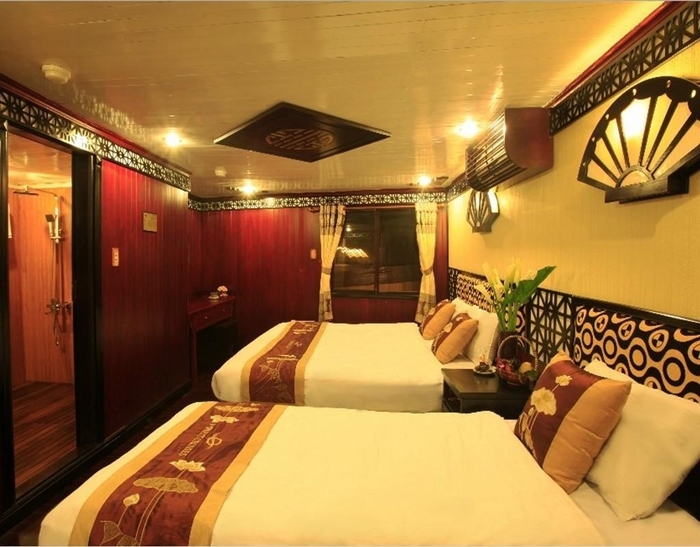 The two recently built wooden junks managed by V'Spirit Halong Cruise will bring you a holiday to remember. 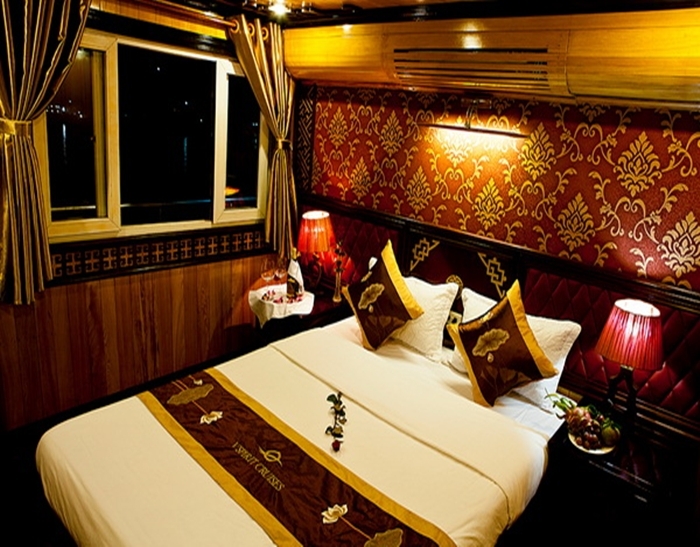 Coated in a traditional design, the junk features deluxe cabins of contemporary style. 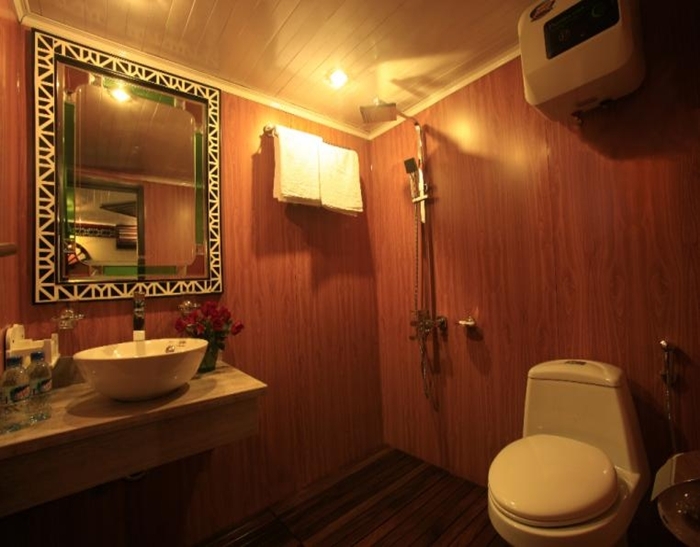 Each cabin has large windows, private bathroom and beautiful sundeck bar. 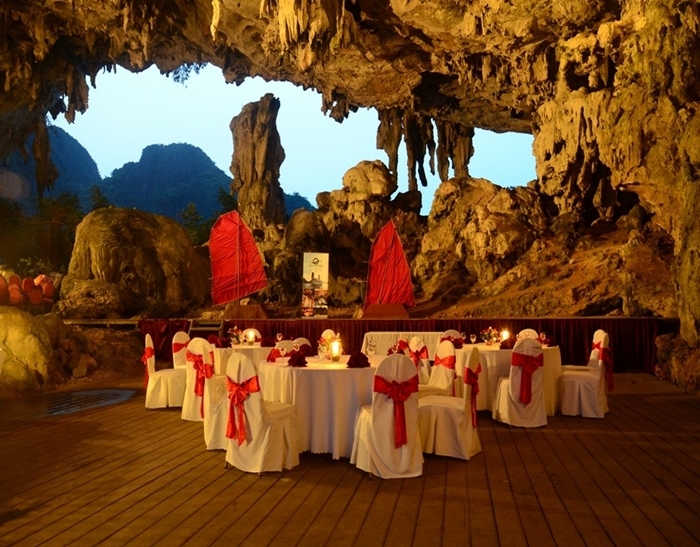 Look no where further as you have found the right one to visit Halong Bay. 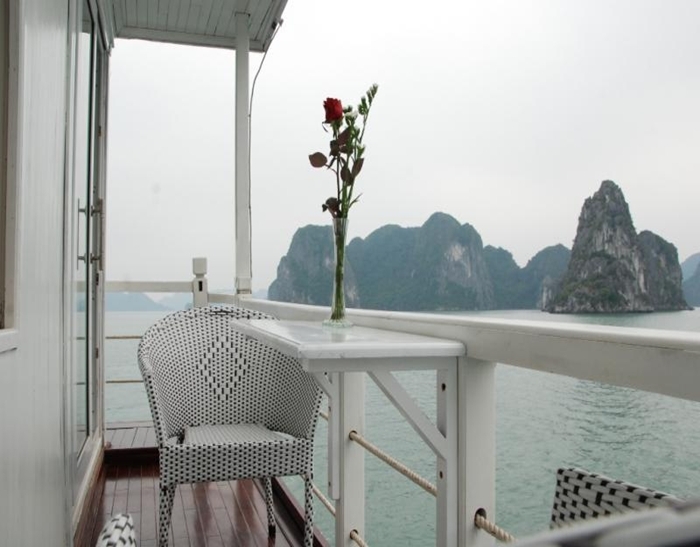 V'Spirit Halong Cruise is one of the latest cruises to be launched in Halong Bay. 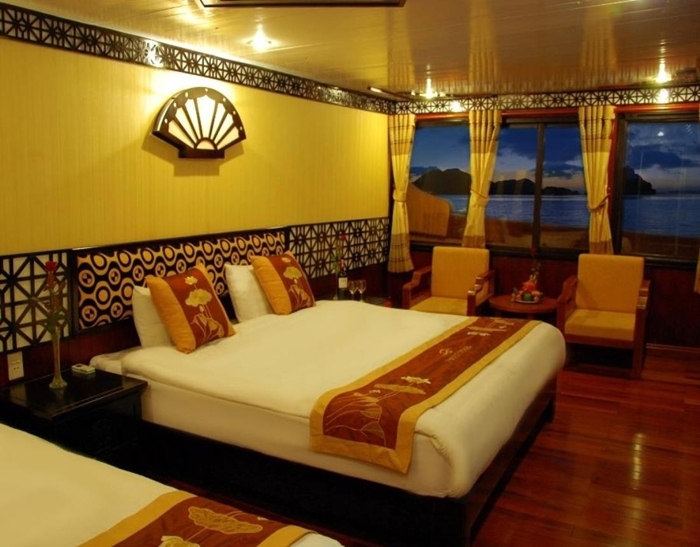 Though joining the team of junks at bay only recently, V'Spirit Halong Cruise soon emerges as a top choice for budget travellers, offering quality stay at a fraction of price. The crew is enthusiastic in every way to make sure you have the best holiday possible. 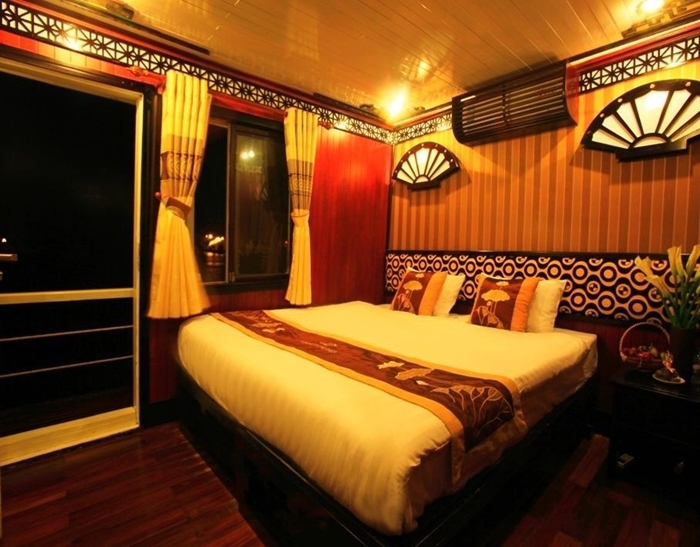 With V'Spirit Halong Cruise you will be staying in a modernly equipped cabins, which feature private sundeck, seaview windows and private bathroom. When it is time for food and socializing, you will be pleasantly surprised by the number of dishes served each meal, attached with history told by the cook. 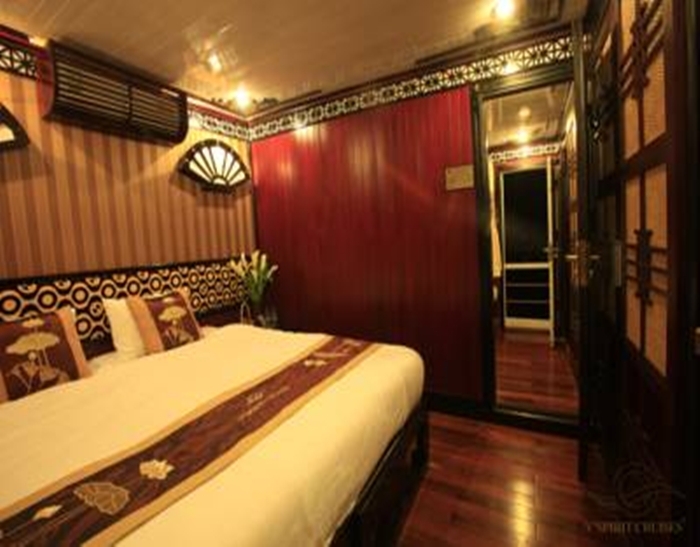 V'Spirit Halong Cruise is without doubt on our top list of 2012, thanks to the excellence in service and quality of accommodation. 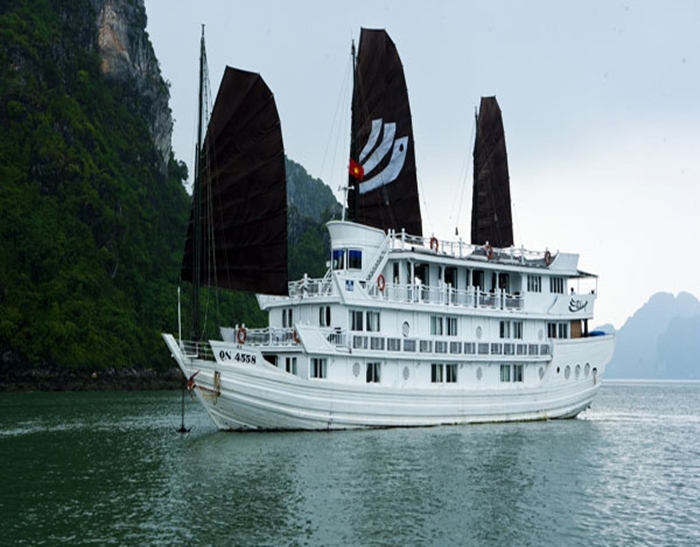 Book Halong V'spirit Cruise and V'spirit Halong Bay Cruise directly through Vietnam Eco Travel to get the best rates, big promotions and discover a different world with our luxury Halong bay cruise and Halong bay tour. 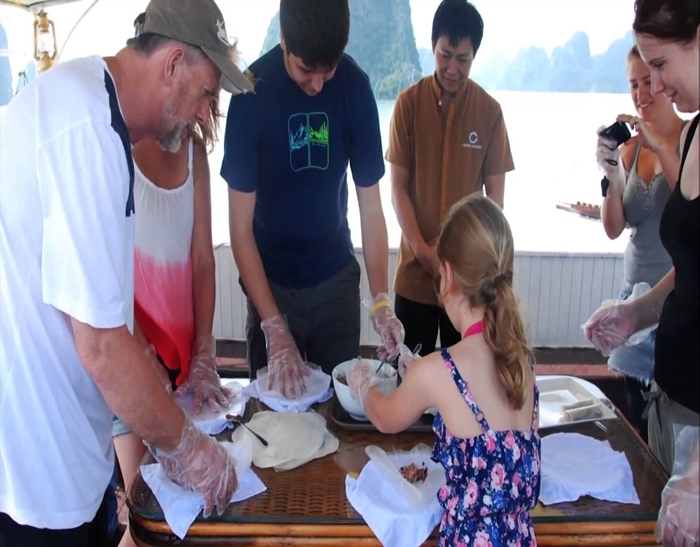 Experienced and knowledgeable fully – licensed local tour guide who have a big love with Vietnamese Cuisine. 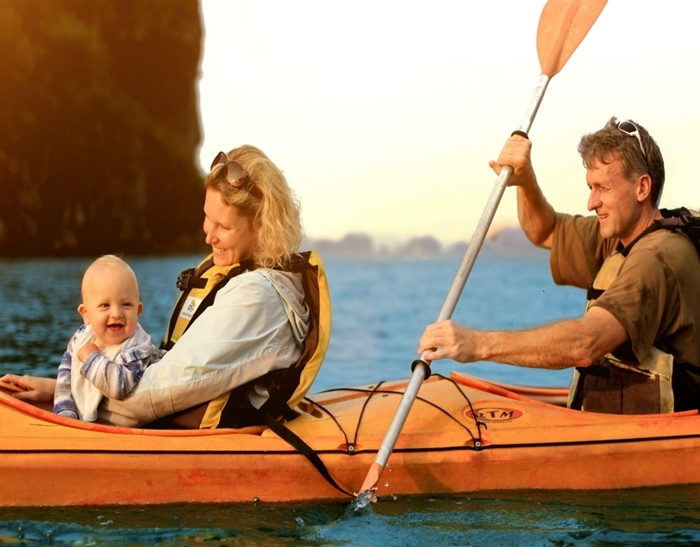 Small group tour with maximum of 10 people ensure a more personalized experience. Learning how to cook some Vietnamese dishes. 08h00 - 08h30 Pick-up at hotel and start the scenic, 3.5 hour drive to Halong Bay. Enjoy the landscape of the Red River Delta country side and have a short break on the way. 06h30 – 07h00 Join Tai Chi exercises or a photo hunt. 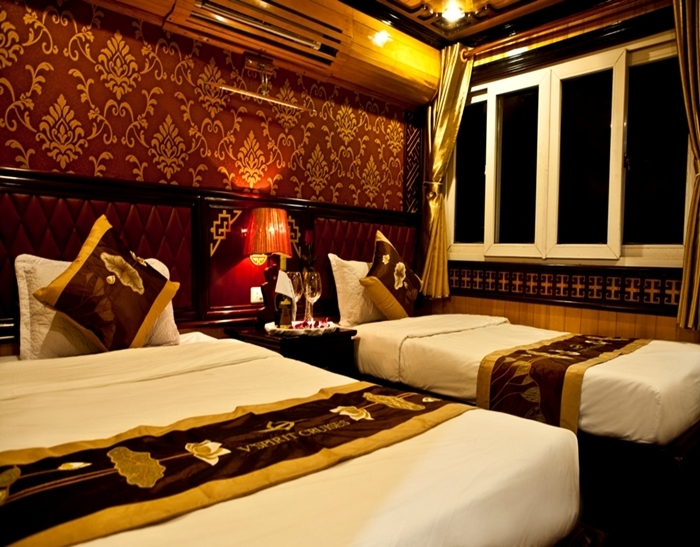 What do you think of V'SPIRIT HALONG CRUISES? 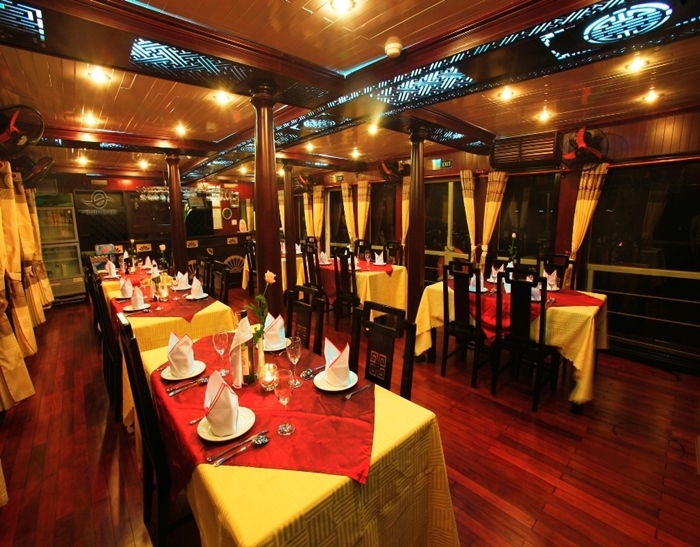 What an amazing 2 day 1 night cruise on Halong Bay. Halong Bay has to be seen to be believed. The scenery is stunningly beautiful! We were treated to first class dining, with friendly staff doing everything they could to make our time most enjoyable. We opted out of the excursion to the caves as it meant climbing up many stairs so we enjoyed drinks and fruit on the top deck in comfortable cane chairs with new found friends. Our cabin was spotlessly clean, the bed comfortable and opened up to a private deck with a couple of chairs. It was certainly an experience to treasure and share. It was a thoroughly enjoyable all too short a trip. The whole team from tour guide Duc, and the crew was exceptional in their service. 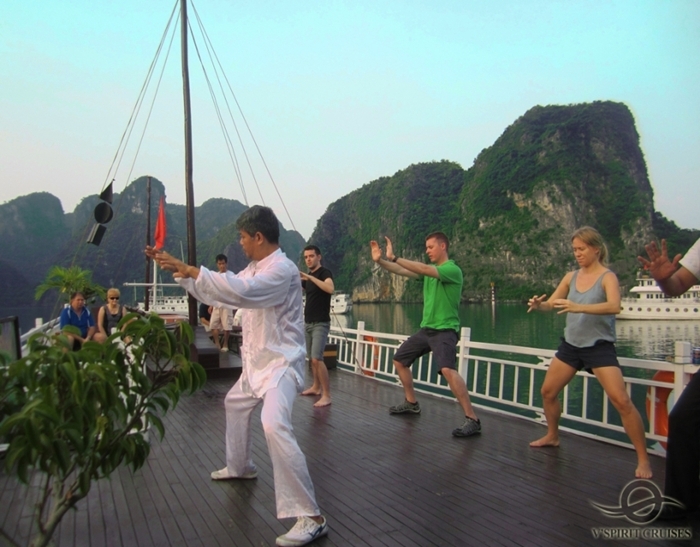 We have a really good time on board the V'Spirit as well as time spent in Halong Bay. All the beds in the cabins are very firm and we slept well. The food served is great and suitable for all our taste buds, the spread is big and in generous portion too. Duc is fun and knowledgeable and takes care of all the guests well. Overall, highly recommended. My husband and I booked a last minute trip with V-Spirit when we decided we wanted to get out of Hanoi for a little bit. Our timing only allowed us to do the 2 day-1 night cruise and it was the best decision! It was a little cold but it was still beautiful and Ha Long Bay is worth seeing! We went to the famous cave and kayaked! The crew was so attentive and the food was amazing! The room was clean and we had the best night sleep! Our only issue...it wasn't long enough! were picked up in Hanoi and driven to the marina in Halong where after a short stop were transferred to the V-Spirit cruise ship. After aclimatizing to the boat we cruised through the islands to an iteresting stalagmite/stalagtite cave which was huge . Returning to the boat we went on to a island lookout with an option of either swimming or climbing to the lookout. Some of our group managed both. The boat was very safety conscious and insisted on life jackets when transferring from boat to smaller craft. The night was spent relaxing. Next morning we had a short Tai Chi session before breakfast and continuing to go kayaking. lots of fun. Back on the cruise boat there was a demostration of artisitic food decorating. All in all a very enjoyable 2 days with a good guide. "A Wonderful group of tour hosts"